The Dolphin Club was founded in 1877, and today is a nonprofit, public-access athletic organization with a diverse membership of about 1500 women and men. Our members swim in the waters of Aquatic Park, row in the Bay and on Lake Merced, play in handball tournaments and participate in the annual Escape from Alcatraz Triathlon. A flat-water rowing facility at Lake Merced, on the western edge of San Francisco. The Club has an exterior ramp for handicap access. Only club members who have completed our certification courses may use our water craft. Visiting non-members may not use any of our rowing boats or kayaks. WETSUIT POLICY: Please take off your wet wetsuit on the deck by the boathouse and hang it with the other wetsuits until you are ready to leave. Our building is over a century old, and wetsuits leave a lot of water that damages the floors, and the puddles are a hazard for everyone. The Dolphin Club is open to the public on alternating days with the South End Club, next door. Daily use fee is $10. 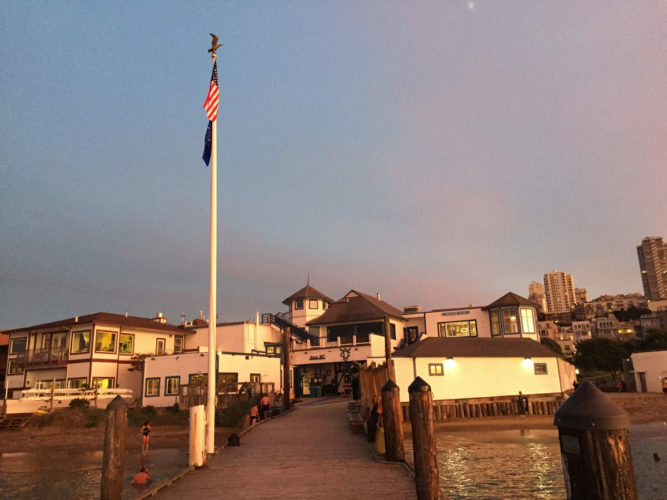 The Dolphin Club and South End Club buildings are owned by the S.F. Recreation and Parks Department and leased to the clubs. Both facilities are open to the public on alternate days each month, Tuesday through Saturday, for a daily fee of $10.00. Sign the waiver and deposit it and your cash or check in the box at the entrance and sign the log book. Ring doorbell for access. Closed to the public Sundays and Mondays.